The 75th planned flight of an Arianespace Ariane 5 launch vehicle should come this Thursday, Sept. 11, from Europe’s Spaceport at the Guiana Space Center in Kourou, French Guiana. The launch is currently scheduled for liftoff between 5:21 p.m. and 6:23 p.m. EDT (2121 and 2323 GMT), and should deliver the MEASAT-3b and OPTUS 10 satellites into orbit. Arianespace has designated this flight “VA218,” and this will be the fourth Ariane 5 launch from the Space Port located in Kourou, French Guiana this year. This includes the ABS-2 and Athena-Fidus launch on Feb. 6, ASTRA 5B and Amazonas 4A launch on March 22, and Automated Transfer Vehicle (ATV) Georges Lemaître launch on July 29. This upcoming Arianespace mission will be propelled atop the heavy-lift Ariane 5 launch vehicle, and comes after the launch of ATV Georges Lemaître back in July, which marked the 60th successful mission in a row for the Ariane 5 rocket. Optus 10 was installed atop Ariane 5’s core stage first, followed by the placement of MEASAT-3b, after it was encapsulated in it’s protective payload fairing, on Sept. 3. After the successful integration of both satellites was completed, engineers were able to move on past this preparation milestone to begin readying the launch complex for the rocket’s flight on Thursday. Next on the list for final preparation will be functional tests, launch rehearsal, and launch vehicle arming to complete the readiness review and allow officials to give confirmation for rollout to the spaceport’s launch zone. MEASAT-3b will be the first satellite released from the Ariane 5’s stack during the first sequence of its separation phase into orbit, and eventually reach a 91.5 degrees East orbital position. Once in position it will work together with its sister satellites, MESAT-3 and MEASAT-3a, to provide video and data service to South Asia and Australia. After the deployment of MEASAT-3b, Optus 10 will be placed into orbit, propelled from its lower position on the launcher’s tower. OPTUS 10 was built by Space System/Loral (SSL) in Palo Alto, California. Optus is the second largest telecommunications company in Australia and they currently operate five satellites over Australia and New Zealand. Optus 10 is equipped with 24 Ku-band transponders, designed to deliver direct TV broadcasts, internet connectivity, telephone and data transmissions across Australia and New Zealand. OPTUS 10 is designed by SSL on the 1300 LL Bus model, and weighing in around 7,209 pounds (3,270 kilograms.) It’s designed to have a 15 year lifespan and orbit at a 164 degrees East orbital position. The launch and trajectory of the Ariane 5 rocket will be controlled by two onboard computers, located in the launch vehicle equipment bay, when the countdown reaches T-4 seconds and the computers will take over final engine startup. Ariane 5’s solid rocket boosters will burn two tons of fuel per second as it escapes the gravitational pull of the Earth. A roll maneuver will begin at 17 seconds after liftoff, followed by booster separation at 2 minutes and 21 seconds. MEASAT-3b will separate from the rocket at 26 minutes and 54 seconds after liftoff, and OPTUS 10 at 34 minutes and 26 seconds into the launch sequence. Several ignitions and stage separations will occur between deployment of the two satellites to ensure they don’t interfere with each other. The Ariane 5 booster tasked with carrying the two satellites aloft is capable of carrying payloads weighing as much as 10 metric tons into a geostationary orbit – or “GTO.” In terms of what the Ariane 5 can send into low-Earth-orbit, this amount doubles to some 20 metric tons. The version of the Ariane 5 which will conduct tomorrow’s flight is the Ariane 5 ECA, is capable of and usually used for the deployment of two spacecraft during a single launch. The rocket stands some 171 feet (52 meters) tall and is about 18 feet (5.4 meters) in diameter. The launch vehicle leaves the pad courtesy of its cryogenic core stage and two solid rocket boosters (SRBs). Unfueled it weighs about 12.2 metric tons, that weight increases significantly when propellant is added. 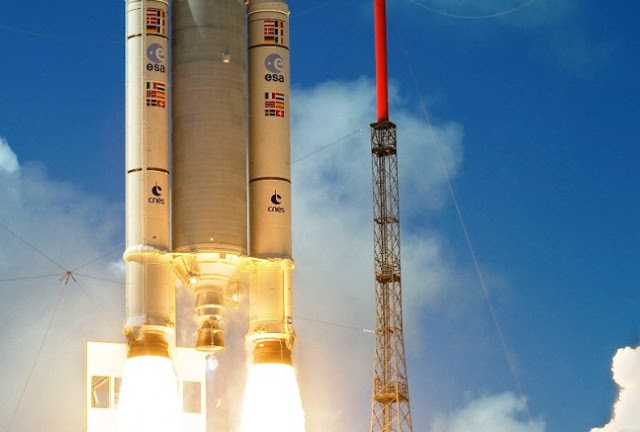 Fully loaded with fuel, the Ariane 5 ECA weighs some 170 metric tons. Ariane 5’s core stage is powered by the Vulcain main engine – it is fueled by an estimated 132 metric tons of liquid oxygen and 26 metric tons of liquid hydrogen. The Vulcain should burn for about 10 minutes, unleashing some 116 metric tons of thrust in the vacuum of space. More than half of the rocket’s height, some 100 feet (30.5 meters) are encompassed by the core stage which stretches from the Vulcain’s engine nozzle, to the rocket’s upper skirt. The ECA variant of the Ariane 5 uses the ESC-A cryogenic upper stage, the “muscle” of the system is provided via the HM7B rocket The HM7B was also utilized on the Ariane 4 family of launch vehicles. In the cold vacuum of space, the HM7B has the capacity to deliver some 67 kN of thrust. According to Arianespace, the engine is fed via a turbopump and is regeneratively cooled. It contains two pumps, one for the liquid hydrogen, the other for liquid oxygen. During ascent, yaw, pitch and attitude control is conducted through gimbaling the rocket engine’s nozzle. Roll control is managed by gaseous hydrogen thrusters on the Ariane 5. During the ballistic phase of the flight, roll, pitch, and yaw are all handled by groups of hydrogen thrusters with gaseous oxygen thrusters providing longitudinal boosts. Each of the rocket’s two Étages d’Accélération à Poudre or “EAPs” solid rocket boosters stands some 30 feet tall (90 meters) and each utilizing some 238 metric tons of solid propellant. The two boosters are only activated after the Vulcain engine has stabilized and is ready to get the mission underway. EAPs provide more than 90 percent of the thrust required to carry out the launch vehicle’s mission and burn for about two minutes and 10 seconds. Once depleted of propellant, they are jettisoned and left to fall back to the Atlantic Ocean. Each EAP is comprised of three segments, the lower or “aft” segment measures some 11 meters and is loaded with 107 metric tons of fuel, the center segment, some 10 meters long carries 107 metric tons of propellant and the forward segment is about 3.5 meters in length and is filled with 23 metric tons of fuel. The booster’s carry a 68-18-14 percent mix of ammonium percholate (which serves as the oxidizer) aluminum (fuel) polybutadiene (which binds the other two components together). Arianespace describes the process in which the boosters are ignited and burns as follows: The combustion process is initiated by a pyrotechnic device, and the solid propellant burns at a radial velocity (from the center outward) of approximately 7.4 mm/sec. These boosters have movable nozzles which are powered via hydraulically-controlled servo actuators. The rocket’s second stage employs a single engine, tasked with delivering payloads to their intended destinations. The upper stage has the capacity to carry out multiple burns, dependent on the amount needed to complete the specified mission. The various iterations of the Ariane 5 launch system are tapped to conduct an array of missions. In the past, the Ariane 5 ES was used to send the European Space Agency’s Automated Transfer Vehicle on its way to the International Space Station, whereas the main line Ariane 5 has been tapped to launch Europe’s answer to the Global Positioning System – the Galileo space-based navigation system to orbit. The ECA version’s manufacturer, Arianespace has suggested that the rocket’s payload fairing be extended an additional feet (2 meters) so as to accommodate larger payloads. This modification should also allow for the deployment of hybrid and electric propulsion satellites. Tomorrow’s launch is not the last planned flight of the Ariane 5 for 2014. If everything goes according to plan, another one of the rocket’s will deliver the Intelsat 30 and Arsat 1 on Oct. 16.